Pet Product News International is running their annual Retailers’ Top Pick Awards. It’s a great way to review the latest new products and to help support the companies and products you believe in the most! 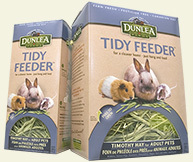 Our convenient hangable Tidy Feeder Hay package is one of the products for consideration in the Small Mammal Products category! Please take a minute to vote for us! Thanks for your support!